Bernie Sanders-backed, far-left candidate Andrew Gillum secured an impressive primary win Tuesday evening in the race for Florida governor. The Tallahassee mayor told CNN’s "New Day" Wednesday that he wants to abolish U.S. Immigration and Customs Enforcement (ICE) and replace it with the Department of Justice. Host John Berman asked Gillum about his push for leftist issues such as abolishing ICE and establishing Medicare for All. “We want to replace ICE with the Department of Justice, an entity that has not been tarnished in the same way as ICE has,” Gillum explained. Berman replied that that was “basically the same thing” as abolishing ICE. A recent poll found that abolishing ICE is not a popular issue even among Democrats. Only a quarter of Democrats support the idea. However, a host of Democratic politicians have called to abolish the agency in a push popularized by Democratic Socialist candidate Alexandria Ocasio-Cortez. Tallahassee Mayor @AndrewGillum pulled off an upset in FL's Dem. gubernatorial primary last night. 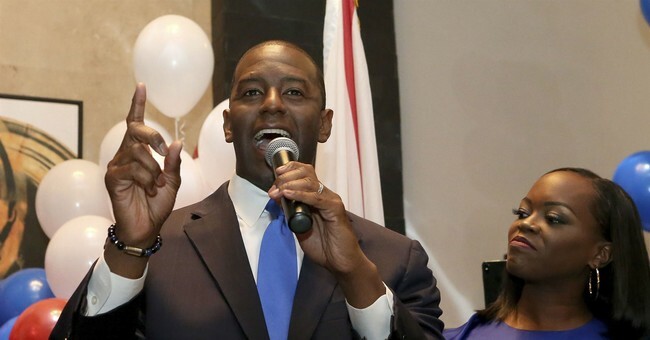 “I am a champion for treating healthcare as a right and not a privilege,” Gillum said of his push for a single-payer healthcare system. "What we are clear about is that we can run wholly on our values," he said. "We can talk to people in a commonsensical way about the issues that confront them, and quite frankly it doesn't matter if you're in the rural panhandle of Florida or the I-4 corridor." Gillum faces a tough race against Trump-backed Rep. Ron DeSantis (R-FL). The President referred to Gillum as a “failed Socialist mayor” in a tweet Wednesday.